My 6-year-old won’t eat a ham sandwich, but tell him you’re making stromboli for dinner and he will think he’s having a great treat! Preheat oven to 400°. Coat two 13″ x 18″ baking sheets with cooking spray. Divide the dough in half. On a floured surface, roll each piece of dough into a rectangle. Place the dough rectangles onto the baking sheets. This will make two stromboli, one on each pan. 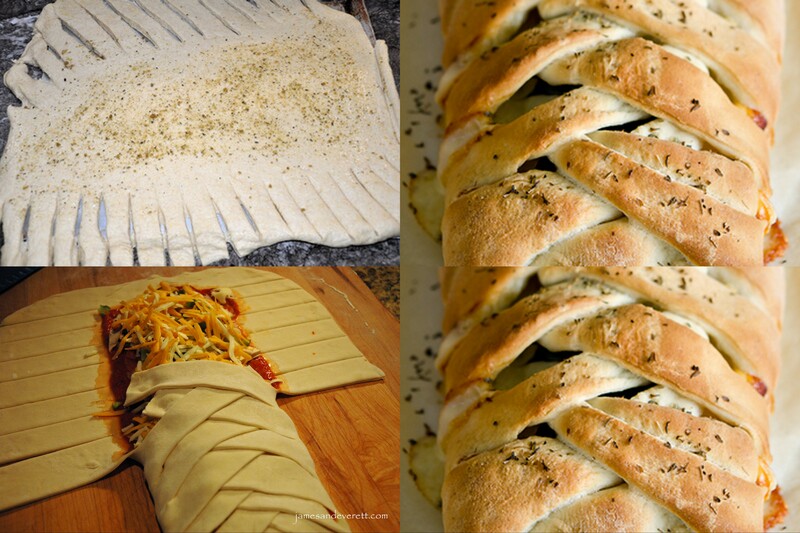 See photos to help clarify the following steps: Working lengthwise, spread your toppings down the center. 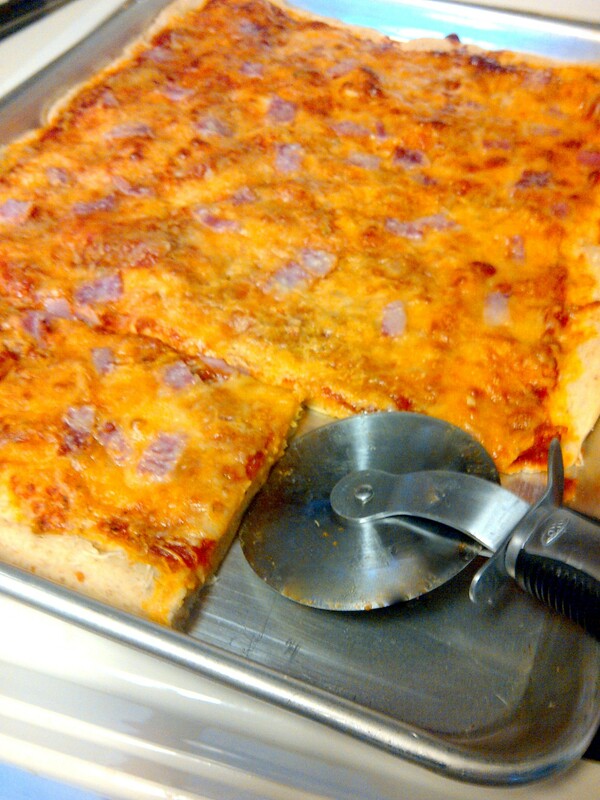 (I use spicy brown mustard, ham, red onions, Italian seasoning and mozzarella cheese.) Use kitchen shears to cut the long sides into strips. Pull the strips over the filling. If desired, brush with egg wash or melted butter, then bake 12-14 minutes. For a long time, my son thought he didn’t like hamburgers, but he would eat a bacon cheeseburger roll-up! Same ingredients, but different preparation. The pizza dough seemed to win him over. Grilled Pizza: (You have to work quickly using this method, so try to have your work station close to the grill, if possible.) Preheat your grill to medium; prepare pizza toppings and set them next to the grill. Divide dough into 5-6 portions. 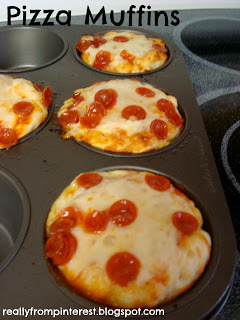 Roll out your pizza dough (1 or 2 portions at a time) on a floured cutting board. Carry the cutting board to your grill and place the dough on the grill. Let it bake for about 60 seconds, then flip. 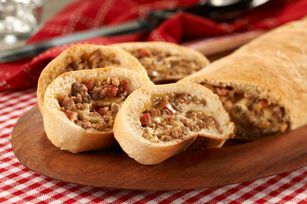 Quickly spread toppings over the dough, close the grill top and bake until cheese is melted and ingredients are warmed, approx. 1 to 2 minutes. We did this for my son’s birthday and it worked out very well. Nobody complained about the kind of pizza they got because they had made it themselves! Either divide the dough into individual portions and let everybody top their own, or spread the dough into one large pan, but use a knife to score the dough into quarters. Everybody can decorate their own quarter and everybody wins!